Don't ask how many people they've killed. They hate that,” EA's representative tells me. “And please stay away from politics.” That's right, readers. It's time to find out just how authentic and respectful this year's other military shooter is. So sit back and get ready to discover just what gun accoutrements are 'in' this season. 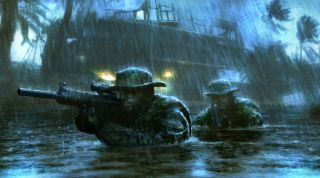 Warfighter started out separately from Medal of Honor, as a franchise all its own, its origins a 'vent book' that Nate and Kevin wrote over a bottle of vodka during a spell in an undisclosed volatile region, frustrated by the dithering politicians back home. In time this became 'Faceless' - a document with the juiciest parts removed and a narrative locked in place, which in turn found its way to the desk of (then Vivendi) executive producer Greg Goodrich. For the Tier 1 operators providing the authenticity (and by extension, the marketing) this was anything but a smooth transition – to the extent that during the development of Medal of Honor, Goodrich penned two resignation letters to help get their views across to the EA brass. Now though, with the warriors themselves penning the Warfighter storyline and a legion of their 'brother' consultants given final edit, Warfighter is finally going to get its time in the sun. Quite the process for a game about crouching behind stuff, in order to shoot the heads of terrorists who are also hiding behind stuff. In terms of Medal of Honor itself, Warfighter's biggest departures are that of geography and history. Like Call of Duty, the game is now dispensing with real world battles and frolicking in fiction – chasing the manufacture and distribution of PETN explosives through a global network of locations such as Somalia and the Philippines. To illustrate his point, Goodrich turns to the screen behind him and conjures an example. The mission is a raid on the flooded Capital Building of a typhoon-struck Isabela City, in the Philippines. Now powered by the same engine as Battlefield 3, this is a game destined to make your graphics card sing. Murky water sloshes around your feet beautifully, grenades leave a pleasant fizz in the air and chandeliers swing violently as they catch the blast. It's a slice of game that screams military shooter, although I'm promised the long-range head pops and stealth of the previous game are still a priority. “If there's a gunfight in a confined space with wood panelling and lattice, and it's half-flooded, what's that going to look like?” asks Goodrich, as we watch a gunfight set in a half-flooded, confined space with wood panelling being splintered. “It's going to be messy, it's going to be dirty, it's going to be gritty. We tried to get this wonderful ballet between water shooting up, wood coming down and stuff just coming at you at all times.” As the player character Preacher climbs the stairs towards the room where the hostages are, a gentle haze of spent cordite hangs in the air – although you'll barely have a second to notice it before a PETN charge hurls him backwards, his arms and legs flailing in front of the screen.